The service will be competitive in price to today’s broadband services from cable and telephone companies, but it will be much faster. Verizon and Comcast must be thrilled. Google says it is doing this on an trial basis to promote new killer apps that will take advantage of the faster speeds, experiment with better ways to deploy fiber to the home, and create pressure for more open access to broadband in general. It sees its effort as complementary to the U.S. government’s national broadband deployment plans, which it also supports. Communities and municipalities who would like to be considered for Google’s service can apply here. Google owns its own vast network of dark fiber around the globe to connect its data centers, speed up search, and lower its cost of streaming billions of videos a month on YouTube. 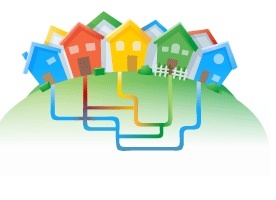 With this project, Google is taking its first step in connecting that fiber backbone to consumer’s homes. It is not clear what Google services will come with a broadband subscription, but it is a safe bet that Google will be the default search and Gmail will be the default email. Maybe they can throw in Google Voice service and an Android phone that lets you talk over WiFi.